In my article creating a repertoire I described my methods of refining and enlarging my openingknowledge of my repertoire. However to built up a repertoire from scratch is for a novice something very difficult. Which opening should I pick up first and what matches with my style? Any opening can be learned but I do understand that many players don't know where to start with the abundance of possibilities. On the internet as in the club people often ask my advise. Should I play e4, d4 or still something else with white? Should I answer 1.e4 with the Sicilian or French.. and which variation? Except a rare case, I normally refuse to help. I have a very narrow repertoire so there are surely players better qualified that myself, able to compare better openingchoices. It also makes little sense to define somebodies repertoire if you don't know well the player. Besides many novices don't have a clue about what chess is about and what exactly can be expected. Therefore it is important as novice to try and taste many openings. I remember that I started with 1.d4. Some readers maybe still remember my article gambits in which I stated that I played hundreds maybe thousands of games against computers. From experience I learned that 1.d4 gives better chances to hold out against computers than 1.e4. Today we all know that 1.d4 leads to a closed game so is more efficient against computers but those basic rules I only heard many years later. I only switched to 1.e4 when big blunders became more rare and I started to play more often against humans. So our openingchoices are heavily influenced by external elements. 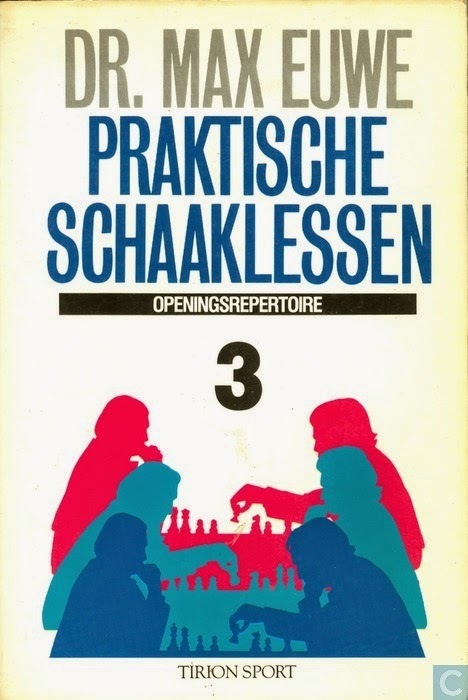 I still remember that in my first tournament (1993) I wasn't satisfied about my openingchoice 1.d4 and in that time I just acquired the book Dr. Max Euwe Praktische schaaklessen deel 3. The book is probably sold out but a player starting with competitive chess doesn't need anything extra. Of course the latest developments aren't covered but the didactic style is very comprehensible and I've consulted regularly the book still many years later. It was this book which let me discover the Dutch defense as an acceptable answer on 1.d4. 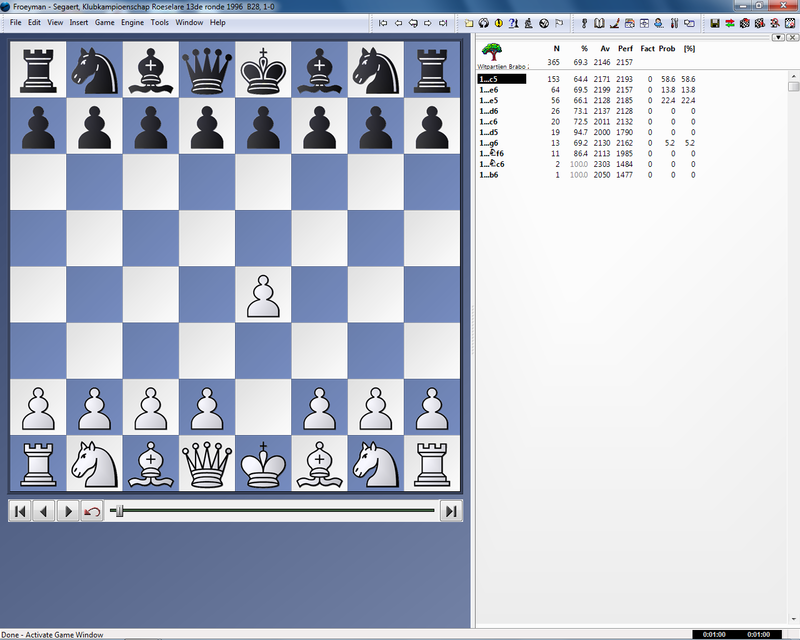 Computers, books have a big influence on our openingchoices but also the openings which other players choose. It is no coincidence that in some (smaller) clubs, half of the players have a similar repertoire. The best player of the club is successful with a specific repertoire and the other players try to copy this to improve their chances. It is pretty logical to play an opening which you can't refute yourself. In fact our repertoire is a product of coincidences and emotions. Some more ambitious players aren't satisfied by this. Wouldn't it be better to build a repertoire in a more scientific way? In my first years I created a mathematical model based on piece-activity to define which openings are good and which are less good. The more extra possibilities you had compared with the opponent, the better the openingchoice. In the initial position white has 16 pawnmoves and 4 knightmoves so 20 in total. 1.e4 is the move which increases maximally the possibilities to 30: 15 pawnmoves, 5 knightmoves, 5 bishopmoves, 4 queenmoves and 1 kingmove. Obviously an absurd method as quantity says very little about quality. On the other hand I learned from this the fundamental principles of occupying the center and strive for activity so it wasn't all useless. A very similar but more complex mathematical model was recently published on Chessbase in which conclusions were made based on square utilization and occupancy. The power of a modern computer was used to process thousands of games. However the same remark is also valid here that such numbers can't be converted to concrete moves. An apparently small detail can chance the complete picture of a position. So is there really nothing which we can use to make in a scientific way a proper openingchoice? Yes there is as we have today engine openingbooks which show statistics of the performances for each opening in practice, see my article green moves. 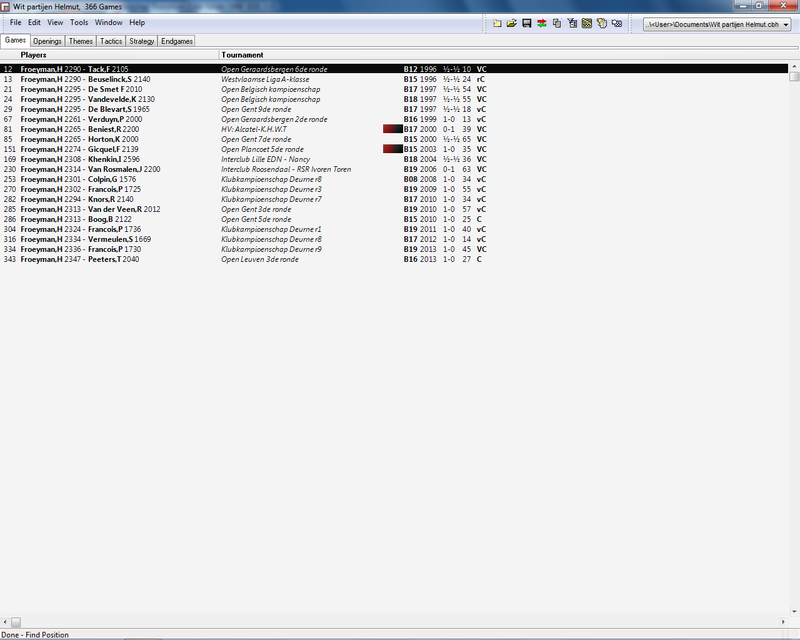 We also have the Chessbase reports which can be queried per player. Not only you get a view about what a player has played before but also how well the player scored in an opening. Although there are serious limitations as Kara rightly remarked in a reaction on my previous article. Such report often shows a distorted picture for amateurs because it mainly includes the games against stronger professional players. Of my 720 standardgames only 255 games can be found in the Big database 2015 and you can only find 1 partial one of my 20 correspondence games in the databases. Besides it is often not really better to choose a variation in which the opponent lost before. If the opponent repeats the line then you can be almost sure that he prepared an improvement. Often it is more interesting to choose a variation in which the opponent scores well or in which he has recently won a game on the condition that you have a fresh idea prepared. Another angel to optimize openingchoices is to start from the own qualities instead of the opponents. A coach can surely help but even without a coach a lot is possible. If you already play chess for some years and you archive the games properly then you can make an openingbook of it which is much more accurate than a Chessbase report from the Big database 2015. If you play many lines by both colors (see article swapping colors) then it makes sense to create a separate openingbook for white and black. I demonstrate the possibilities of this scientific method with an example of my white openingbook after the first move 1.e4. You always have to be very careful with statistics as very often wrong conclusions are made. First we need to check if there are sufficient data points to absorb statistical fluctuations. In the article to study chessopenings I indicated that the influence of openings is rather limited to the final result of the game. 10 games is the absolute minimum to tell something meaningful but preferably we have many times more. We also need to take into account the opposition. Instead of looking to percentages it is more interesting to look to the TPR achieved. In the example we see some remarkable differences in TPR between the different black answers on my first move which can't be just explained by statistical noise. Some openings really fit me better than others. We see that my opponents with the Scandinavian defense (d5) averagely underachieve with 200 points (2000-1790). However with the Caro-Kann (c6) my opponents perform averagely 100 points more than expected (2011-2132) so there I lose rating. This info shows clearly where a repertoire should be adapted or improved. The same process can be repeated for positions deeper in some openings. The repertoire is built by openings which statistically result in superior performances. Players with a broad repertoire can extract an extra advantage from this method by also applying it during a game-preparation. Suppose your opponent plays against 1.d4 a line in which you score slightly negatively but against 1.e4 he chooses a line in which your report shows a +100 TPR for you then of course you start the game with 1.e4. Now I surely don't claim that with this scientific method always a perfect openingchoice will be made. Sometimes you are in the mood to play something more creative or a draw is more than sufficient. Playing an opening in which you don't score well, can also be educative. Besides a score doesn't have to stay forever negative as below screenshot from my Caro Kann games demonstrates. Despite the negative TPR of 100 points we discover that I won my last 9 games although against modest opposition. Some study can influence a performance positively. Therefore it is often better to prepare statistics from only the more recent games again at the condition there is sufficient data. Playing and trying a lot is fundamental to get an acceptable return by this method. The last few years I couldn't play much due to the combination of work-family so I just muddled around. Small adjustments to my repertoire are regularly made but I don't experiment with completely new openings. Pragmatism or fear, something which is open for debate.